Local artists and musicians collided this past weekend at Good Fortune Jewelry for a night of creativity. The jewelry store, located on Main Street in Keene, hosted an art and music show in their back room on Friday, March 4. Work by Keene artists Molly Fletcher and Dylan Jones was presented at 7 p.m. and local band Omoo Omoo, who had their first show playing as a full band that night, began jamming at 9 p.m.
Good Fortune Jewelry owner Roger Weinreich said the store has been hosting events like this for almost 25 years now and that he especially enjoys contributing to the local art and music scene. Over the years that Good Fortune Jewelry has been hosting musicians and artists, Weinreich said there has been a diverse crowd of people who have walked through the store’s doors. However, there is one ingredient that must factor into every artist or musician who plans to perform or present work at Good Fortune Jewelry. Lack of originality wasn’t a problem for Keene State College adjunct professor Molly Fletcher, who was one of the two artists to display her work at the Friday-night show. Fletcher, alongside local artist Dylan Jones, said she worked with the local arts organization Machina Arts to put the show together in honor of Jones. “Dylan is actually moving to Portland, Oregon, next week and we decided to have a co-show together and put our stuff out there together one more time before he leaves,” Fletcher said. Fletcher said that shows like the one at Good Fortune Jewelry, which allow artists a place to display their work for no charge, are exactly what the art and music scene in Keene needs. Fletcher, who graduated from KSC herself in 2007, also said she hopes that events like these urge students to get involved with the local art and music scene. “We’d love to get students involved – Art majors, art minors or even students just interested in art. It’s an opportunity for seniors to get their work out there and to get more involved with the city and as well as the campus,” Fletcher said. 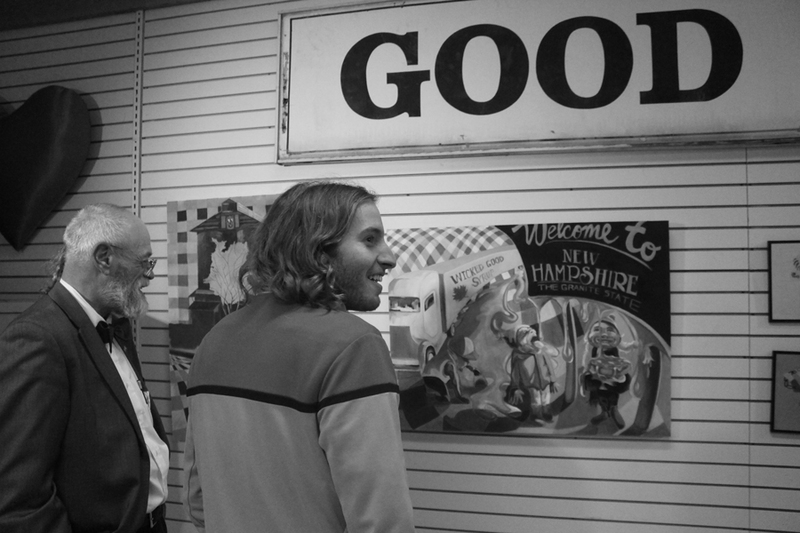 While there were no KSC students actually playing in the show or displaying artwork, 2015 graduate Joshua Seamans said his roommate found out about it from the Monadnock Food Co-op, so the two decided to check it out. Stephanie McCann can be contacted at smccann@kscequinox.com.